There's just a tiny incorrectness in one of the Hebrew letters. A small lack of a line, and this tattoo spells not "Mercy" but "Lack" or "Absence". See, Mercy in Hebrew is "Chesed", but turn the letter Dalet into a Resh, and you've ended up with "Cheser", which means something else entirely. 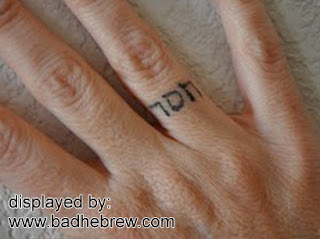 I like how it is still a real Hebrew word, though. Dalet and Resh are very similar, aren't they? Luckily for this woman, her tattoo is very easy to fix. Just add a tiny protrusion to that Resh, and she's back in the righteousnesses business. Ha! Anonymous, that angle never crossed my mind, and it's awfully hilarious :) Good job! how would I write: I shall fear no evil, for you are with me? Well...it *is* a kosher dalet, for what it's worth. Ugly, but kosher. The sticking-out-bit on the back of dalet is there to reduce ambiguity (and for kabbalistic reasons), so it's customary to have it in our most formal scripts, and in a fair proportion of our less-formal scripts, and accordingly in fonts - but coming right down to the question of "Is this a dalet or a reish," as answered by those arbiters of meaning the Torah scribes - it's a dalet all right. I'd think that "chesed" is intended to mean grace, not mercy... makes more sense Christian religion-wise. It was marked as Mercy where I found it, otherwise I'd have assumed Grace as well. There is even a chance that the artist copied the letter wrong. I just got this as a tattoo today (it is correct, I have even had people check the original to make sure, and I checked the image before it was even made permanent). It is "chesed" but, in English, there are no words for it. The closest is that it is God's love, grace, and loyalty through the covenant He made with His people. But there is truly no one word to describe what it is. Well this tattoo can be actually fixed by a small line on the right, though I doubt the owner of the tattoo even knows that there is a mistake. Chesed means kindness. Not sure where all this "grace" stuff comes from. I have seen the same word with three dots in the buttom of two letters! What do you think about it? Which is correct, with or without the dots? Both are correct actually. The dots are called 'Nikud' in hebtew which are litterally translated into 'Dotting'. They are used to help the reader how to exacltly pronounce every letter of the word. When a word comes without Nikud the reader would typically understand the meaning with the context of a specific word. For one to be able to read hebrew without Nikud it would take long time of experience with the language for agreat deal of words in hebrew have more than one pronounciation anc meaning that should be understood depending on context. For these reasons the Nikud would mostly appear in texts that are intended for youngsters thst are still learning the language, uncommon names and words and words that could be mistakly read in the wrong context.